It’s hard to complain when you are expressing thanks. Gratitude overrides self-pity, FOMO (fear of missing out) and other feelings of lack or not enoughness. Sometimes though, in the chaos of life, we don’t put our gratitude into action and gratitude in action is powerful. It lifts you and everyone around you. Like most things, if we don’t keep it simple, our thanks can get lost in the shuffle. Here are a few really simple recommendations in this short and sweet guide to saying thank you. I can think of so many times when I meant to send a thank you text, or note and thought, “I’ll do it later.” Of course when later showed up, I’d think, “now it’s too late” or I’d forget all together. Put your gratitude into action as soon as possible. If you are thrilled with your service at a restaurant, leave a note for the manager on the back of your check. After you read a book you feel grateful for, drop the author a note and/or leave a review on Amazon or another bookseller’s site. When you are moved to say thank you, say it. Write thank you cards consistently. Stock up on stamps and note cards, and express your gratitude in a handwritten letter once a day, or every Sunday, or three times a month. This project will inspire you. Every morning when you wake up, jot down a few things you are grateful for. Keep it simple. For example, I’m grateful for my bed, hot coffee and sunshine. Use a notebook or something more structured like The Five Minute Journal. Don’t wait for things to be good to be grateful. It’s always a good time to be grateful and that means expressing thanks even when you aren’t feeling your best, or things aren’t going your way. Even in the dark times, there are things to be thankful for. It may be more challenging to feel or express your gratitude, but then it’s even more important to do it. If you over think your thank you delivery, it won’t happen. If you want to send flowers but you don’t know which ones, or picking out the right card seems overwhelming, let your gratitude be enough. Send the flowers later if you get to it but for now, “Thank you, I’m so grateful” is enough. It’s everything. 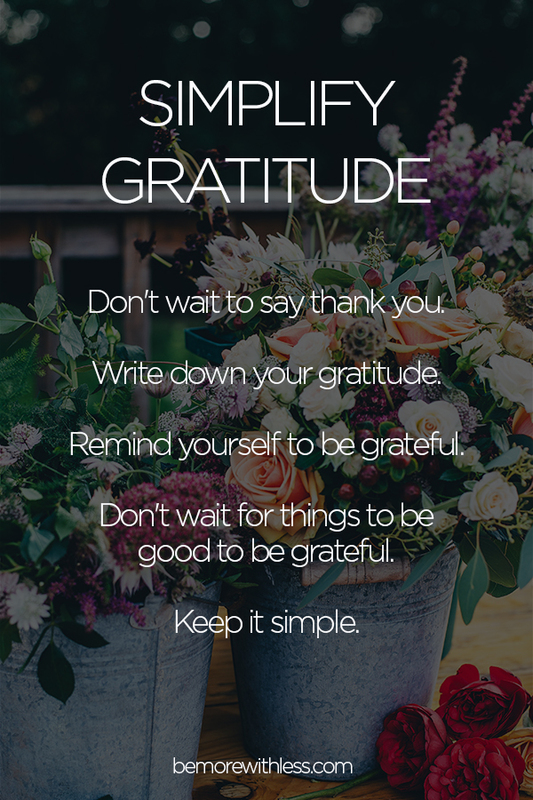 Expressing gratitude is a practice and if you keep it simple, it will be more meaningful than you can imagine (for you and everyone around you). It takes time and consistent effort. I’m working on it too so I’m going to keep this short, pull my gratitude out of the later file and put it into action. Before I go though, I want you to know how grateful I am for you. Thank you for reading this, for considering these recommendations, for sharing my words and your feedback and stories. Thank you for being here, for being you and for letting me be me. My cup runneth over. P.S. Speaking of keeping things simple, we announced 31 Days of Gifts you so Deserve (the Advent calendar for your inbox) last week and things were confusing. We’ve simplified the instructions and hope you’ll join us for a month of comfort and joy. Learn more here. Thank you for sharing your thoughts and ideas that make a positive difference. Your book “Soulful Simplicity” is well written and authentic; so good that I purchased a copy for my Mom. Your strength to persevere and create a better life while going through the process of change is admirable. You truly became more with less. Thank you for sharing so much with all of us. You have inspired me to start my simplifying journey. I have unsubscribed to all but a couple of my favorite blogs and you are one of them. I love those ideas! I’ve been procrastinating on writing an email to the manager of a lady at the bank who was so helpful to me a week ago, and I wish I would have written a note before I left that day! I love that you say, “Don’t wait for things to be good to be grateful.” My Thanksgiving post this year was about how I found gratitude during an extremely challenging (and traumatic) time last year. Thinking of how much my life has changed–in wonderful ways–as a result of that time, really changed my outlook! Thank you for this blog, Courtney!